Woodhouse Restaurant is located in the famous amusement park Tivoli located in the center of Copenhagen. Woodhouse is a typical burger and café restaurant making a lot of fried food such as French fries, hot wings, etc. Since the restaurant did not have any fire protection system installed, the Danish Fire Authorities demanded that a solution was to be found for the object protection of the fat fryers. 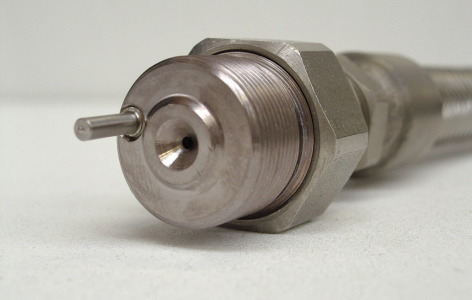 VID Fire-Kill was able to help solve this problem with their unique stand-alone system Model DFI-1 which is approved to protect most commercial fat fryers. The Model DFI-1 are small, reliable, self-contained, automatic fire protection systems designed to automatically detect any fires in the fryers and automatically release the special wet chemical firefighting medium, which will extinguish any oil and grease fires up to 25l. Whilst detecting the fire, the system will also make sure the power source to the fryer is shut down ensuring that the fryer does not reheat the oil again creating another fire. – The system works 24/7. 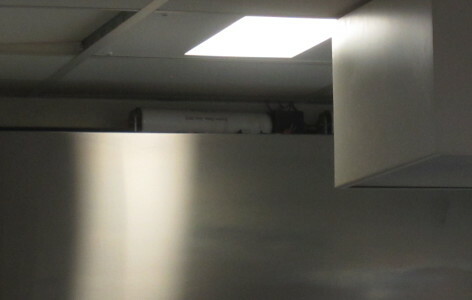 The nozzle was attached to the extractor hood, having the nozzle and integrated heat-detector pointing towards the cooking area whilst the rest of the Model DFI-1 was installed above the hood making the installation invisible. The Model DFI-1 alarm outputs where connected to fire alarm panel and to a relay ensuring that power supply to the fryer would be shut off in case of fire.